1. Heat ½ tbsp oil in a large frying pan over a high heat. Add half the mince and cook, stirring, for 3 - 4 minutes until browned. Remove the meat from the pan and set aside along with any cooking juices. Repeat with the remaining mince and another ½ tbsp oil. 2. Put the remaining oil in the pan and, when hot, add the onion. Reduce the heat slightly and cook, stirring, for 5 minutes until softened. Add the garlic, spices and oregano and cook for 1 minute. Return all the mince and any cooking juices to the pan, stir in the ketchup and season. 3. Add the tomatoes to the pan, then fill the can with water and rinse out into the pan and add another ½ can of water. Bring to the boil, then simmer gently for 20 minutes, stirring occasionally. Add the kidney beans and simmer for a further 10 minutes. Meanwhile, cook the rice according to pack instructions. 4. For the guacamole, mash the avocados and stir in the chilli, salad onions, coriander and lime juice, then season. 5. 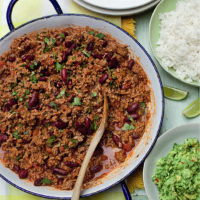 Scatter the chilli con carne with chopped coriander and serve with the rice, guacamole and lime wedges. This recipe was first published in March 2012.